Come out and tap into spring! Enjoy live entertainment, demonstrations, face painting, wagon rides, local vendors, axe throwing and of course real maple syrup and pancakes! Don’t forget to take some maple products back home with you, available for purchase in our Maple Shop! Event Hours: 10 a.m. – 4 p.m.
**Excludes Daycare, Day Camps and School Groups. To reserve for these, please call 1-800-367-0890. Parks Members: Get in FREE / BUY MEMBERSHIP NOW! 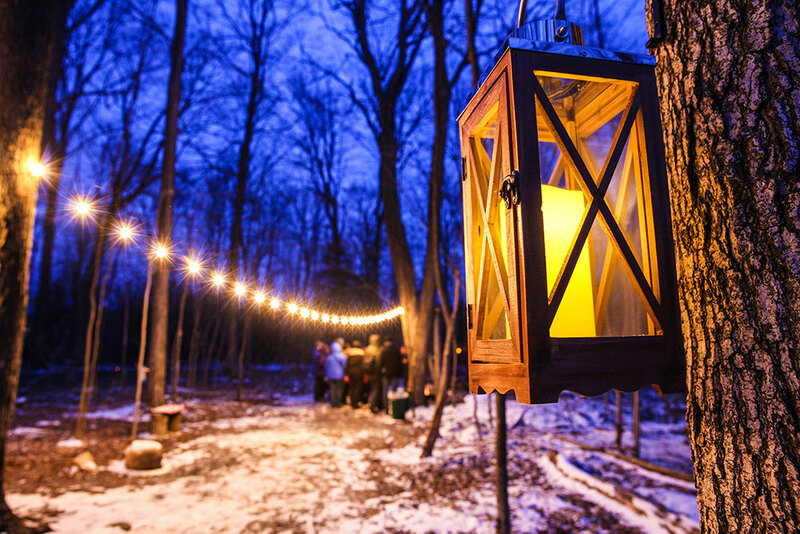 Description: Bring a friend or your sweetheart to be guided by lamplight through the story of the maple sugarbush. Start the tour off with a warm beverage and enjoy the magic of the forest at night as you learn about this very Canadian tradition. End the night with warm campfire treats, a decadent taste of maple taffy and a choice of an alcoholic beverage. Maple syrup and products will be available for purchase. Appropriate for ages 19+ LLBO event. Advanced Tickets Required. * Tickets can be redeemed at any location and on any date of the festival, during public hours. Hours and days vary at each location. Must present tickets to receive entry. Wagon rides 10 a.m. – 4 p.m. Giant games 10 a.m. – 4 p.m. Maple scavenger hunts 10 a.m. – 4 p.m.
Activities with Museum of Dufferin 10 a.m. – 4 p.m.
Wood branding ($) 10 a.m. – 4 p.m.
Metis trapping and heritage display 10 a.m. – 4 p.m.
Face painting with Makin Faces ($) 10 a.m. – 4 p.m.
Axe throwing with Far Shot Orangeville (12+) 10 a.m. – 4 p.m.
Sugarbush tour 10 a.m. – 4 p.m.
Taffy station 10 a.m. to 4 p.m.
All-day pancake breakfast ($) 10 a.m. – 4 p.m. Vendors and community booths ($) 10 a.m. – 4 p.m.
Scott Rowe, chainsaw carver 10 a.m. – 4 p.m.
©2019 Sugarbush Maple Syrup Festival · Toronto and Region Conservation Authority.